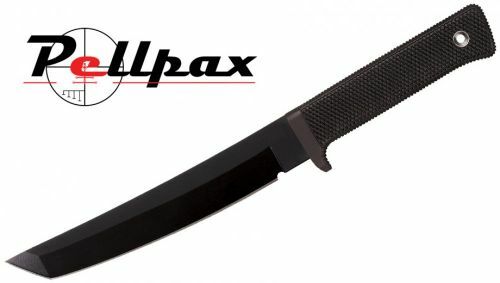 The Recon Tanto from cold steel is a popular knife in camping and hunting communities. It's Large, durable blade and comfortable, grippy handle ensure full user comfort and allows it to take on even the toughest cutting jobs. Built to last the blade has been forged from Stainless Steel - VG-1. This metal is known for it's pure durability and high stain / corrosion resistance. This allows the knife to be used in a variety of conditions for many different jobs without showing signs of wear. The blade has a very sharp cutting edge leading round to the tanto shaped tip which makes the knife efficient at penetrating materials effortlessly. Finally the blade has had a Tuff-Ex finish which is furthers the resistance of the blade increasing the life time of your knife. The handle of the Recon Tanto has been designed with user in mind. It has been crafted from Krayton, a rubber like material, and has a deep textured surface for optimal control and comfort. The Handle Measures 4.75" in length allowing it to fit practically anyone's hand. Add this item to your basket & spend an extra £367.01 to apply for finance.